Unexplored or uncharted rapids where navigation may be very difficult to impossible. Luck often considered an important part of a successful negotiation. The biggest stickler/contentious issue about certain rivers is going to be the river grading scale. At the moment it is the lowest grade sections to the highest grade sections. 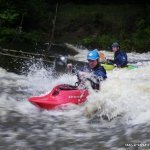 In future if there is a continued discussion/debate, irishwhitewater.com will intervene and get an expert paddler who is local to that river to make a judgment call on the grade of that river.